It’s the Zombie Apocalypse and Grandpa Willy is rolling with the times. Once upon a time, there was a game that saw a Grandpa Willy that wakes up in a hospital bed, with his right leg in a cast and no idea what’s happened to him. To make matters worse, the hospital in which he wakes up in is overrun with zombies and the world has gone to hell. Across 120 levels, Grandpa Willy had to roll his way to freedom and now that Grandpa and the Zombies has come to Switch earlier this month, now he’s got to do it all over again. With involvement from TWP and Tivolva with regards to development and publishing and featuring comic book like graphics, is a top-down puzzle game that will test the resolve of both the player and Grandpa Willy. In Grandpa and the Zombies, across the game’s 4 worlds, (each world consisting of 30 levels,) players control Grandpa Willy’s movements and must co-ordinate him to the exit. Sounds simple right? Except it’s not that simple since Grandpa Willy is in a wheelchair and if the player pushes the left analog stick upwards, he’ll roll up and keep on rolling until he hits an obstruction. It is by using the obstructions and walls and even certain zombies named Chained Charles that players must take advantage of, in their bid for freedom. Instead of the zombies having free reign, they actually move when the player does and depending on what type of a zombie they are, they will move in the same direction. Others however, will only move up and down, or left and right. While for the most part, the zombies shouldn’t pose too much of a risk, if you plan your moves just right, but they can still get in the way quite a bit, so when the time comes to sacrifice them by having them step into an electrified death trap, to make a certain tile on the floor safe again, don’t be afraid to make the most of it. It’s impassable to you otherwise. Other ways to get rid of zombies include having them walk off-screen in an area where there is no wall. I’d advise not following in their footsteps since going off-screen will kill Grandpa Willy and have you have to restart the level. Still, even if you masterfully navigate every single level, dodging every hazardous zombie in the process, it’s all for nought if you don’t collect the 3 pieces of candy that are on every level. Not only are they present as an extra obstacle you need to overcome, but you actually need them to open up the other worlds. 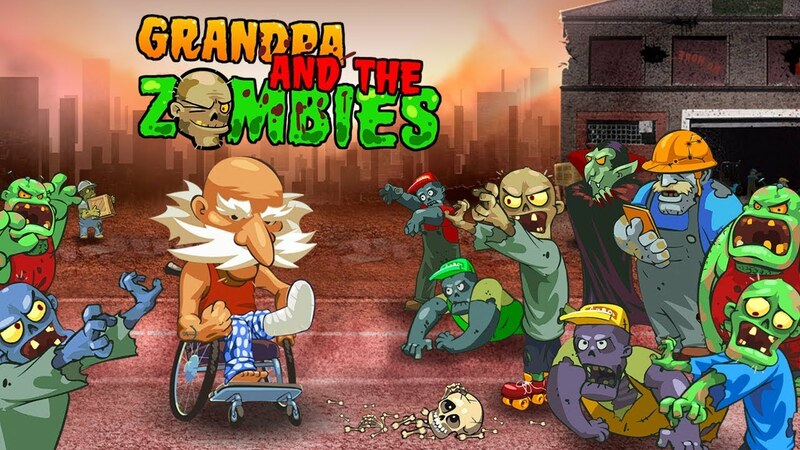 If you are looking for a simple, yet puzzling puzzle game that you can play at any time and play in both short and long bursts, there is some fun to be had with Grandpa and the Zombies. It may not hold your attention for too long, but you will enjoy it while it lasts. Just don’t take the frustrations you’re bound to have, out on Grandpa Willy, he has enough stuff he’s got to contend with.